WASHINGTON (CNS) — Dozens of activists gathered at the steps of the Supreme Court June 30, awaiting the court’s much-anticipated decision on the constitutionality of the federal contraceptive mandate as it applies to for-profit businesses whose owners’ object to it on religious grounds. The family-run company Hobby Lobby was the primary plaintiff in the suit that reached the high court. A similar challenge by the Conestoga Woods woodworking company was paired with the Hobby Lobby case by the court. “I couldn’t be more excited. This is a huge day for Americans both along the left and along the right, both Americans who are pro-life and pro-abortion, because the court upheld our fundamental right to religious liberty. And that’s something that affects all of us,” Hawkins said in an interview with Catholic News Service in front of the Supreme Court. “I find it absurd that the government and President (Barack) Obama feel that pregnancy is a preventable disease and that we (women) have to be given free birth control pills in order to be equal to men. We’re already equal to men,” said Hawkins. Activists came to the court with groups such as Students for Life of America and Young America’s Foundation, and many came on their own accord to support Hobby Lobby. They celebrated the ruling as a victory for religious liberty — and for the pro-life movement. “It was a big victory and I think it’s a step in the right direction,” she said. “The very fact that the Supreme Court of the United States has finally gotten it right today, that’s a huge deal. I’m very ecstatic. I’m very excited for this victory,” he told CNS. A smaller crowd of activists lined the sidewalk behind those celebrating the court’s decision, many wearing Planned Parenthood T-shirts and carrying signs from the National Organization for Women and NARAL Pro-Choice America. 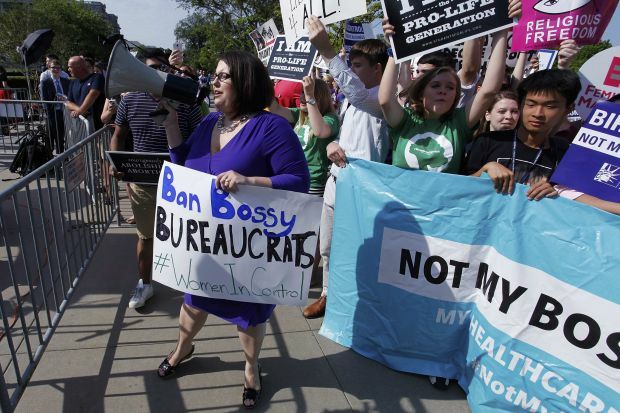 “Birth control is basic health care — no Hobby Lobby exemption,” said one sign. “Keep the boardroom out of my bedroom,” read another. The activists remained on the sidewalk for more than an hour after the court ruled that closely held companies cannot be forced to comply with the Health and Human Services contraceptive mandate. They said they considered it a loss for women’s rights. At one point, several pro-life supporters and supporters of unrestricted access to abortion attempted to cover one another’s signs as news cameras panned the crowd. David Elizondo, who lives in Washington, held a sign that read, “Birth control is not my boss’s business” and chanted. Hawkins considered the court’s decision a victory for women, and was encouraged by the number of young pro-life activists present.